"Thanks Lindsay for the awesome review! I just stumbled across your review this afternoon. You have accurately described all of the great benefits of using natural deodorants and Crystal. Thank you. I'll simply add, you can send your friends to our website for a $1.00 off coupon. One last note - one thing that makes natural deo's different is that we prevent bacteria from growing (a la, the stink) instead of masking it. Therefore, you must have clean skin when you apply it. That's it! Be sure to drop us a line and let us know your other favorite natural health and beauty products." I must tell you about a product I've been using for the last month, because IT. IS. AMAZING. Yes, I'm talking about deodorant, ladies and gentlemen. 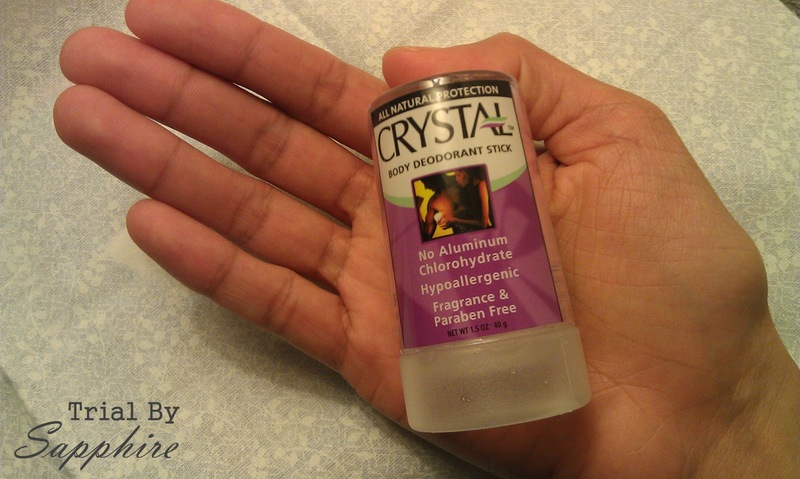 Crystal Deodorant, to be exact. "Regular antiperspirants prevent your body’s normal sweating function by blocking glands with aluminum molecules so small they can enter the blood stream. Though highly debated, it has been suggested that this might put you more at risk for breast cancer and Alzheimer’s disease. Why be at risk when you could be kind to your body?" While the effects of aluminum and parabens in regards to cancer are still being studied, it has been proven that aluminum enters the blood stream which is not natural. I still use water-proof mascara, but I'll cut back on unnatural ingredients where I can. I kicked antiperspirant to the curb last year but didn't use Crystal until a month ago, and all I could think was, "How did I not know about this sooner? Why don't more people use this?" It doesn't leave the slightest bit of residue. 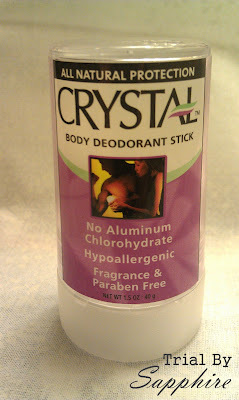 It eliminates odor (even after 75 minutes of hot yoga at the end of my work day, no joke!). It fits in the palm of your hand and can be packed into any bag. Even my husband uses it now and was surprised at how well it worked. It has one ingredient: natural mineral salts. I'm a fan, and I'll scream it from the mountain tops! I think you should give it a shot. Your body will thank you. Think about it. You spend all that time getting clean in the shower. Don't you want to apply "clean" ingredients to your arm pits afterward? (The answer is: "OMG, Lindsay! Yes! I totally do!") Yeah, that's what I thought. To read about the other hippie ways we've been cleaning up our lifestyle, click HERE. **Disclosure: I did not receive compensation for this review. I plan to try it, after my Clarins deodorant runs out. Thanks, Linz! I intend to give it a try. Thanks for this worthwhile recommendation! I've actually used mine a few times now, since you were raving about yours. I can't tell if it's really working though. I feel like I'm applying it wrong. I'll keep trying though, and at least the other doderant I'm using is paraben and aluminum-free. I found this blog yesterday and I immediately thought of you. It seems like a great source of information on natural health and beauty. Thanks Lindsay for the awesome review! I just stumbled across your review this afternoon. 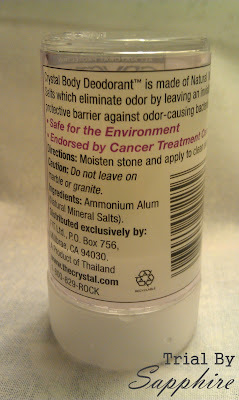 You have accurately described all of the great benefits of using natural deodorants and Crystal. Thank you. I'll simply add, you can send your friends to our website for a $1.00 off coupon. Be sure to drop us a line and let us know your other favorite natural health and beauty products!